Here is the Dollar General Black Friday Ad for 2013. Dollar General will be open on Thanksgiving Day on Thursday November 28th from 7AM – 7PM with a terrific one-day sale. One Day Deals – Prices valid on Thanksgiving Day (Thursday, November 28th) from 7AM – 7PM. 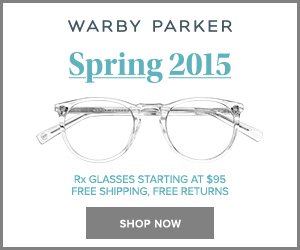 These are one-day only deals. 50% off all trees and ornaments (available in most stores). 50% off 100-ct clear or multi-color Christmas lights. 26? stuffed animal Curly Bear, $4.00. Pac-Man Connect & Play video game with 12 classic games, $15.00. Craig 7? portable DVD player with remote, $35.00. Craig 32? stereo sound bar system, $25.00. SEGA Genesis ultimate portable game player, $25.00. iSound iGlow dancing light speaker, $32.00. Atari Flashback 4 game console, $28.00. Toastmaster single serve brewer, $48.00. Maxwell House 12 ct K-Cups, BOGO at $7.25. Print $1.00/1 Maxwell House cups. Campbell’s Chunky Soup or Ragu, $1.00. Print $.50/2 Campbell’s. $1.00/4 Campbell’s in the 10/6 SS. Assorted single serve candy bars, 2/$1.00. And print buy two get one free M&Ms. Buy two get one free Snickers bars. And another buy two get one free M&Ms. Buy two get one free Mars singles. Pepsi, Mountain Dew, Sunkist, Canada Dry, 7-Up, A&W 2-liters, $.85. LG Optimus Zone (Verizon), $25.00. Available in most stores. Huawel Inspira H867G, $25.00 (Net10). Available in most stores. All toys excluding electronics and as seen on TV, buy one get one 75% off. Cannot be combined with any other offer. Dial, Tone, Caress, Dove, Axe, or Suave holiday gift sets, $8.00. Print $2.00/1 Axe gift set here. Dial white bar soap 8 ct, $3.00. Use $2.00/2 in the 11/10 RP or $1.00/1 in the Nov. AY. 50% off select Christmas hanging decor. Assorted appliances reg. $20-$30, $15.00. Christmas tumbler or Coca-Cola travel mug, $2.50. Sarah Peyton 3 LED candle or tumbling fountain, $5.00. Armor All or Bell & Howell gift sets, BOGO at $10.00. GE soft white longer life 4 ct bulbs, BOGO at $1.95. Nestle multipack ice cream novelties, $3.50. Doesn’t say size. 10 pack Capri Sun juice drinks, $1.50. 4lb Clover Valley Sugar, $1.75. 12? Tombstone pizza, $3.50. Use $1.00/3 in the 10/13 SS (exp. 11/30). Brawny 6 roll paper towels, $4.75. Print $.55/1 here. Glade Plugins scented oil refill with free warmer or premium spray, $1.95. Use $1.00/2 refills in the 11/3 SS or $1.50/2 Glade Winter Collection products in the 11/3 SS. Pedigree 3.5 lb dog food, BOGO. 3lb Whiskas meaty selections, BOGO. Previously viewed DVDs, BOGO at $1.95. 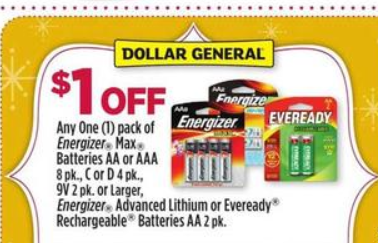 Energizer Max AA or AAA four pack, $2.00. “See in-store display for additional savings.” $.50/1 in the 10/27 SS. Sega Genesis wireless classic game console, $28. Polaroid stereo ear buds, BOGO at $5.00. Whiskas Temptations cat treats, BOGO at $1.75. Prices in the Toy Book are good 10/14-12/24. 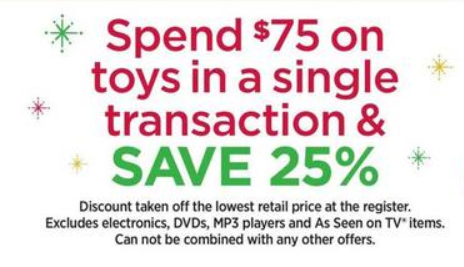 Spend $75 on toys in a single transaction save 25%, excludes electronics, DVDs, MP3, as seen on TV, cannot be combined with other offers. Here are a few highlights. Doc McStuffins Boo Boos or Big Book of Boo Boos, $5.00. Jake & the Neverland Pirates or Minnie table & chair set, $30.00. Hot Wheels Ready To Play Turbo Abduction or Super Spin car wash, $10.00. In-ad coupon 12/8-12/21: Buy one Hot Wheels car for $1.25, get one for a penny. Ninja Warrior play set, $3.00. 18 piece battery operated classic train set, $5.00. Mega Bloks 40 pc maxi bag, $10.00. 48 piece big block set, $10.00. 15 piece shaper sorter, $5.00. Thomas & Friends take n’ play Sodor Lumber Mill, $16.00. Barbie Shoe crazy jewelry activity set, $5.00. Monster High travel purse, activity set, dress up set, or scrapbook kit, $5.00. Lil’ Abby and Emma dolls, $5.00. Princess story dolls 2 pack, $5.00. Play food & skillet set, $4.00. Licensed tea party set, $10. Princess tea set or cupcake play food set, $5.00. Dr. kit or doll stroller, $8.00. Metal toy cookware set, $10. My first Cookin’ Kitchen (this is small!) $20.00. My Very Own self checkout set, $20.00. Make It Girl! kits, $5.00. Various Lisa Frank sets, $5.00. Make It Girl! funky hair chalk set, $5.00. Various artish school supplies, $.34-$1.00. 22 piece play food basket, $5.00. Ton of $1.00 stocking stuffers. Assorted Opoly board games, $10.00. Tummy Stuffers, seat pets, flashlight friends, doodle dome, $20. Craig color changing tower speaker, $40. Girls’ Disney dress-up set, $10. 6 foot pre-lit trees from $20-$30. Holiday kitchen towels, oven mitts, pot holders, $1.00.